WASHINGTON (AP) — After the brazen poisoning of a former spy, British Prime Minister Theresa May quickly pinned the blame on Russia. So did U.S. Secretary of State Rex Tillerson, in what ultimately became one of his last public statements before being fired. But at the White House, President Donald Trump's initial response was more circumspect, with his spokeswoman pointedly avoiding naming Russia as the likely perpetrator of the attack. Tougher rhetoric came only on Wednesday evening, when White House spokeswoman Sarah Huckabee Sanders put out a statement saying the U.S. "stands in solidarity with its closest ally" and shares Britain's assessment that "Russia is responsible for the reckless nerve agent attack." For U.S. allies and some congressional lawmakers, it was another befuddling example of the president appearing to soft-pedal in the face of Moscow's provocations. Some Russia watchers said the fact that the U.S. had to play catch-up to align itself with the British was glaring, particularly at a time of uncertainty over the trajectory of American foreign policy. The pressure on Trump to forcefully respond to the poisoning of Sergei Skripal, a former Russian agent convicted of spying for Britain, and his daughter Yulia escalated Wednesday when May announced the expulsion of 23 Russian diplomats and severed high-level contacts with Moscow. May also vowed both open and covert action against Russia, which denies being behind the nerve agent attack. The White House initially said Trump agreed with May on "the need for consequences" following the attack, but did not specify whether the U.S. planned any punishment of its own. 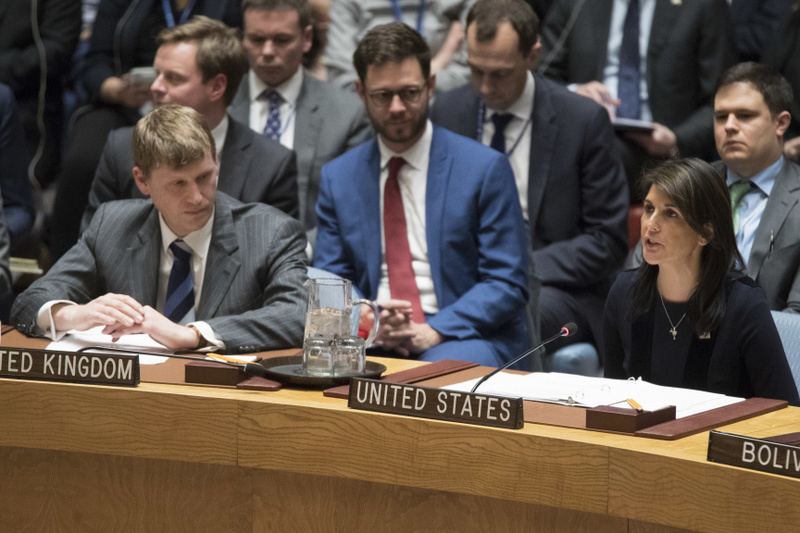 Nikki Haley, the U.S. ambassador to the United Nations, said Wednesday that Russia must cooperate with the British investigation and "account for its actions." Sanders' statement Wednesday evening went further: "The latest action by Russia fits into a pattern of behavior in which Russia disregards the international rules-based order, undermines the sovereignty and security of countries worldwide, and attempts to subvert and discredit Western democratic institutions and processes. The United States is working together with our allies and partners to ensure that this kind of abhorrent attack does not happen again." Some congressional lawmakers had nudged Trump to bolster the U.S. response, including Republican Sen. Ben Sasse of Nebraska, who said, "Americans ought to be leading a conversation with our NATO allies about a collective response to this act and future acts of aggression." May's rapid response stands in stark contrast to Trump's handling of Russia's interference in the 2016 presidential election, which is now a centerpiece of special counsel Robert Mueller's sprawling investigation. Trump has often muddied the conclusion of U.S. intelligence agencies, declaring that while Russia interfered, others likely did as well. And he's irritated Russia hawks in Congress, including numerous Republicans, by declining to use a new law letting the U.S. slap sanctions on foreign companies or governments that do business with Russia's defense or intelligence sectors. Those powers took effect in January, but so far nobody has been punished. This latest Russian provocation against a close U.S. partner comes at a particularly delicate moment for the Trump administration, with both allies and adversaries closely watching U.S. foreign policy after Tillerson's ouster. Though Tillerson faced initial skepticism about his posture toward Russia given his business relationships with the Kremlin, the former head of ExxonMobil emerged as a leading Russia critic in the Trump Cabinet. He repeatedly took Moscow to task for its actions in Ukraine, Syria and elsewhere. "Rex Tillerson was the person that Donald Trump was relying on for Russia policy," said Andrew Weiss, who held national security positions during the Bill Clinton and George H.W. Bush administrations and now serves as vice president for studies at the Carnegie Endowment for International Peace. "That's all now up for grabs." Trump has tapped CIA Director Mike Pompeo to replace Tillerson at the State Department. The former Republican congressman has accepted the intelligence agencies' conclusion that Russia interfered in the election, but has downplayed the notion that the meddling was an effort to help Trump get elected. "The Russians attempted to interfere in the United States election in 2016. They also did so before that," Pompeo told Fox News Sunday. "There's a long history of Russian efforts to influence the United States and conduct influence operations against the United States." Pompeo also raised eyebrows earlier this year by meeting senior Russian security officials in Washington days before the Trump administration declined to impose new sanctions on Moscow over the election interference. Pompeo described the meetings as normal contacts for the heads of espionage services. If Pompeo is confirmed by the Senate, the U.S. relationship with Russia will be among the most vexing issues he has to tackle. Tillerson lamented the state of affairs with Moscow on one of his final days as America's top diplomat, unaware he was about to hand off the problem to a new secretary of state. "I've become extremely concerned about Russia," he said. "We spent most of last year investing a lot into attempts to work together, to solve problems, to address differences. And quite frankly, after a year, we didn't get very far. Instead what we've seen is a pivot on their part to be more aggressive."